My name is Christy Keeley and I live with the life long congenital and challenging condition, Cerebral Palsy. One of the pleasures for me and many others living with a disability is taking part in water-based activities such as swimming. There is nothing like getting into a pool and feeling the burden of a tight, stiff and pained body relax and enjoy the water. It is like stepping into a different world. 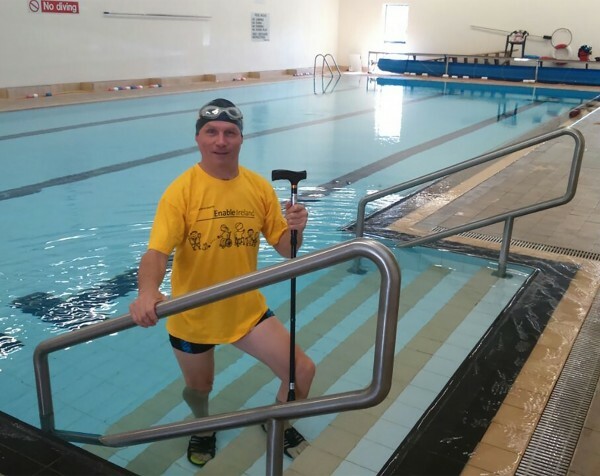 Hundreds of children and adults with disabilities use the Enable Ireland Hydrotherapy pool in Sandymount ever year. The temperature of the pool is maintained at a very warm 34–36º Celsius. The warm water allows muscles to be moved more easily and physiotherapy in this environment is highly effective. It’s also great fun! However, the pool is now a number of years old, and the facilities are much in need of updating. The changing areas need to be expanded and refurbished, and the poolside and reception areas require modernisation and upgrading to ensure improved access for all. That’s why I’m asking you to join me on 27th June for the Enable Ireland Swimathon to help raise funds for the Sandymount pool. It does not matter if you can swim one or 100 lengths; we would be delighted to see you on the day. To register, simply text ‘Swim with Christy’ to 087 760 9768, email eastfr@enableireland or call Sean or Justin on 01 261 5914. Take the plunge and join me on the 27th. The Hydrotherapy pool at the Enable Ireland site at Sandymount was built in 1991. Hydrotherapy pools are different to other swimming pools in that the temperature is maintained at a very warm 34/36ºC. This allows those with physical disabilities to receive physiotherapy in an environment similar to a very warm bath. The warm water allows muscles to be moved more easily and physiotherapy in this environment is highly effective. Having users suspended in water allows them to use their bodies in ways not possible if in a wheelchair or on the ground. Being able to move independently and freely while suspended in water can be enormously liberating for people who normally have greatly restricted movement, elevating mood and opening their minds to their abilities. In addition to the facility being used by staff providing hydrotherapy and water-based fun sessions for service users, the facility is also used by service users and their families for leisure activities, by adult services users, and by school children for water familiarity sessions and swimming lessons. Also, because of the specialist facilities, the warmth of the pool and ease of access e.g. hoists and sloped pool access, we can facilitate a protected time for orthopaedic recovery patients to access the pool to complete their recovery exercises. It is also very popular with local community groups and with the general public for both open swims and lessons.